A list of the things we will include in the sessions – really an indication of what we will be covering during the course. Some things will be very quick – an explanation of the terms and where to find out more, other topics will be in more depth. This will depend partly on the group. 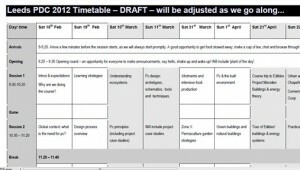 Here you can find linked a sample timetable (in PDF) of a 12-day Permaculture Design Course, as delivered by Graham Bell at The Red Shed – Garden College, in Scotland over 6 weekends. Agreed curriculum and a timetable which we hope delivers Poetry, Inspiration, Love and Longing. But competent starting points. 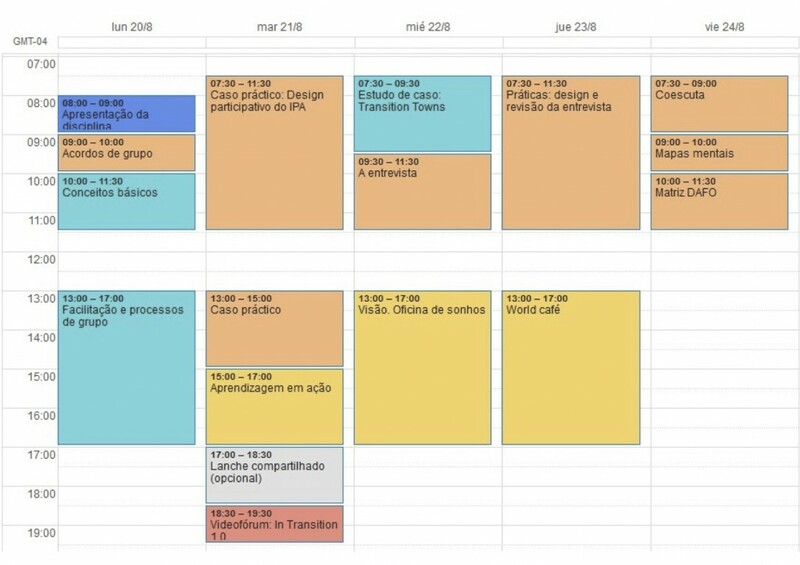 This timetable is adjusted for every audience we teach. You always have to tailor the end result to the participants. So, for example, we tend to be swayed to the climate zone we are in. But you also need to teach what happens in other climate zones, but biased to the needs of the people you have there. 72 hours is a tiny amount of time to deliver the core curriculum. So don’t try and fill people full of facts. Inspire them to learn more and give them a basic understanding of how it all fits together. 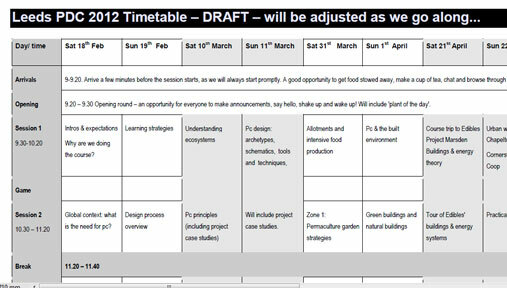 Here is a PDF the core curriculum v 1.6 as produced by the Education Working Group of the UK Permaculture Association. 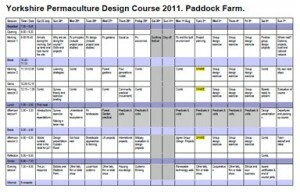 Below you can find linked a PDF of a sample 10-day intensive certified Permaculture Design Course, as delivered by Cultivate at Cloughjordan Ecovillage in Ireland. 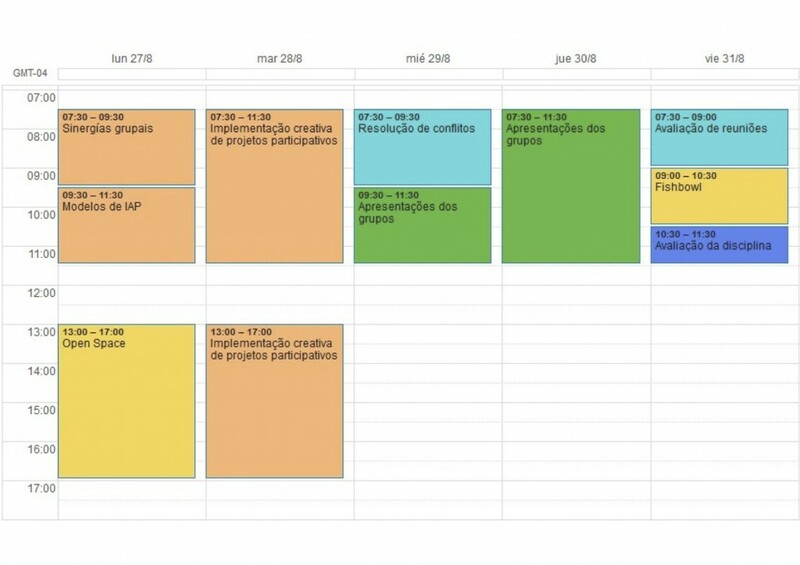 A Winter School is described in the linked file that is run in 12 sessions of 4 hours (excluding travel) spread over 6 weeks. Design exercises in different contexts allow students to hone design skills and learn meta skills. The file is a course outline – a work in progress with some obvious items lacking such as student hand-outs and rubrics, to be updated as the course unfolds. The course aims at introducing the permaculture design concept so that each participant, at the end of the course, has a very good grasp of it and some very solid base to start to deepen their knowledge about permaculture, either by self-study or by attending a PDC. The course does this by leading the participants through a design journey that on one hand, teaches the necessary basic ‘ingredients’ to do a permaculture design and on the other, prepares the participants to do a conceptual design of the site where the course is held so the students can a have a good feeling of what is involved in doing a permaculture/ecological design. The course also aims at giving some practical hands-on skill, where permaculture design is applied, like the design and implementation of a synergistic garden or some other physical feature according to the site’s and owners’ needs and wants as well as the time available within the course schedule. Didactic analysis is a model to prepare an educational activity. It takes you through the steps and elements of the learning experience. Starting situation (Beginsituatie): collect information about the state of existing competencies and proficiencies of your learners. Add information about other characteristics like learning style and cognitive development for your target audience. Outcomes (Doelstelling): what do you expect your learners to achieve in this learning experience. Use SMART (specific, measurable, attainable, relevant and time-bound) criteria to formulate operational outcomes – in terms of demonstrated behavior. Creating a rubric may be useful. A rubric is a matrix of competencies, levels of proficiency and matching behavior. It is a set of criteria for grading. Cathrine Dolleris presented how to create a session plan on the 25th of September 2013 in Mas Franch. The session presents learning outcomes and planning of your session as a tool to become a more confident teacher. Notes from the session are coming soon. 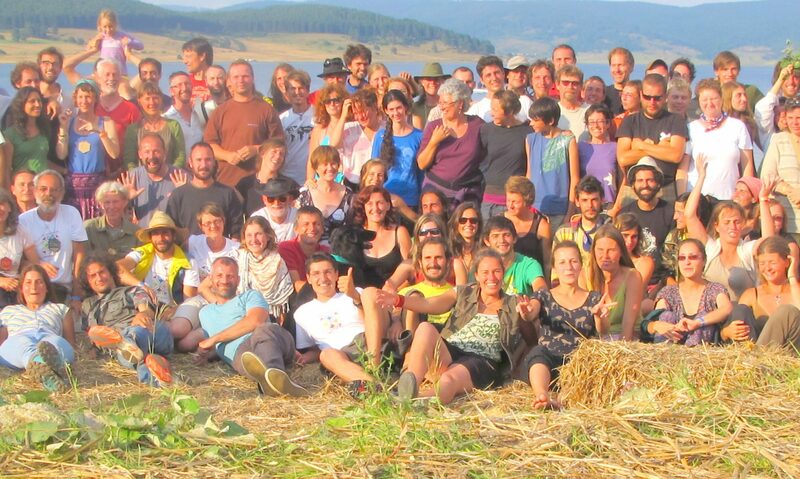 Participatory methodologies for implementing Permaculture and agroecology projects: session plan available here. 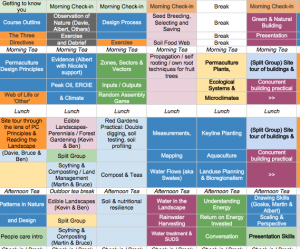 A 4-Day workshop, developed by Mihail Kossev Permaculture design is more than just gardening, but a process of creating community. 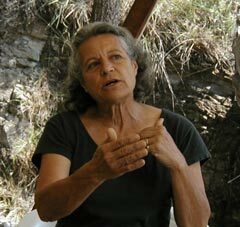 This workshop aims to emphasize the culture in permaculture. 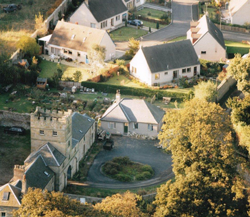 In recent years, we have seen a boom of permaculture courses all over the world. 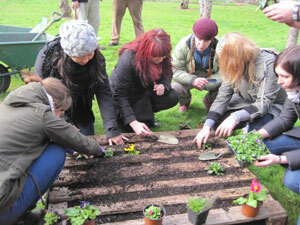 Permaculture has gone viral, it’s infectious. The idea of living in synergy with nature among people you admire and love has become the dream and ambition of many… This wave has spurred entire libraries of information about organic growing and food production, natural building and new ways of thinking about economy. When reviewing the resources currently available, we asked ourselves, what’s missing? What needs further development? Now that we know the principles and practices of land design, how do we make these “eco-village” dreams come true?